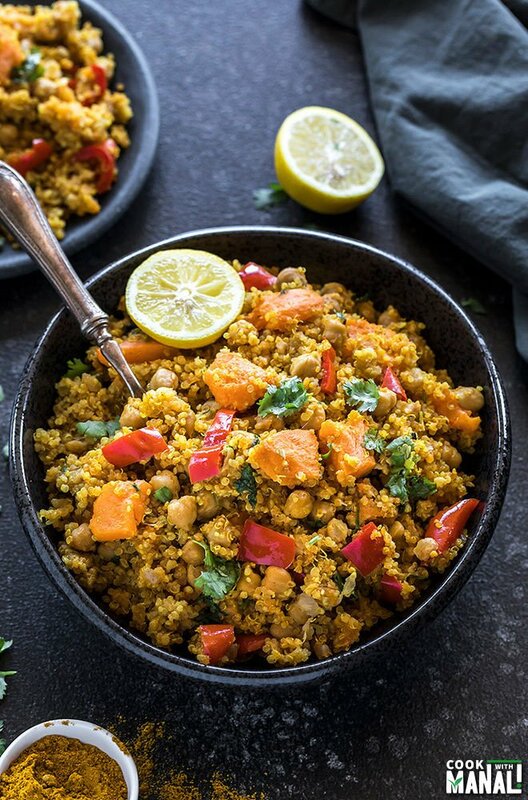 Instant Pot Curried Sweet Potato Chickpea Quinoa – a healthy, wholesome vegan meal made in the Instant Pot. 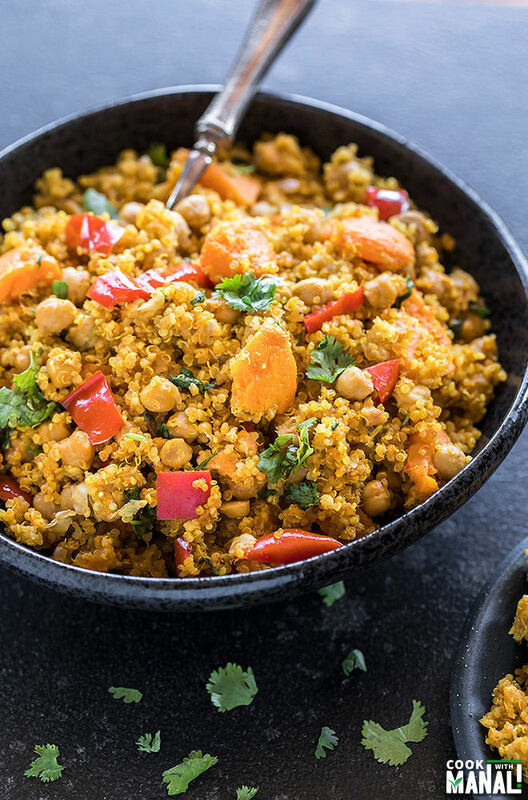 So easy to put together, vegan and gluten-free! Eat it for lunch/dinner or pack for your lunch-box. Also great for meal-prep. I have been struggling a lot lately with making lunches and dinners. I can’t remember if I shared this with you guys, but my cousin is visiting us from India. She has been here last 2 weeks and we are having a great time. However things have been a little busy too. On weekends, we are always travelling so I am not really getting the chance to plan my week. Usually I plan all the blog work on weekends and do the groceries accordingly. But with us travelling all weekends (we are showing her around), we usually get home at like 10 pm on Sunday and then I have no courage to any planning. 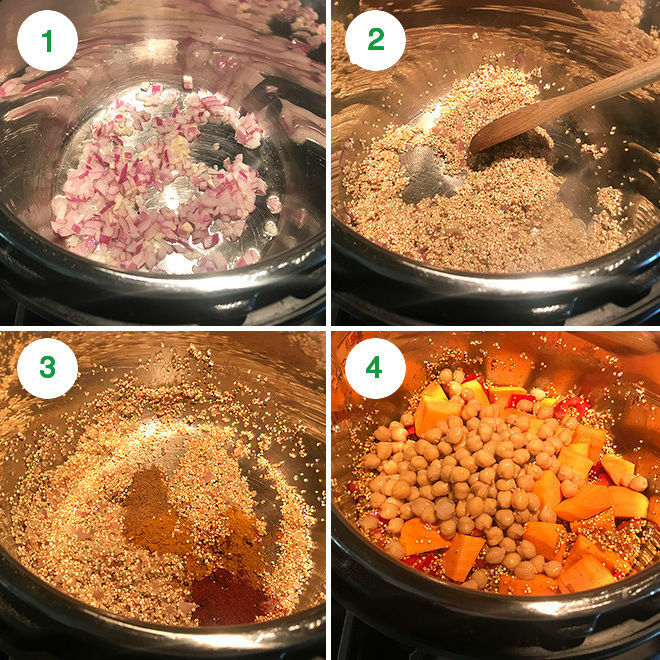 So on one such “grocery shortage” day, I made this Instant Pot Curried Sweet Potato Chickpeas Quinoa! I had some sweet potatoes on hand and so I thought of throwing them with quinoa to make a wholesome meal in my IP. 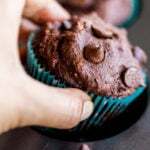 It turned out really good and I had to share the recipe with you guys! 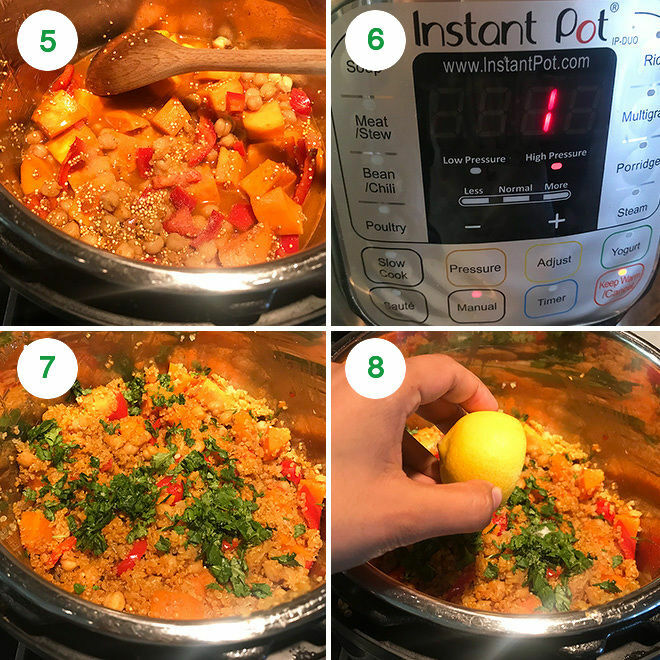 This is what I love about my Instant Pot – the ease with which I can make something so quickly for lunch. It saves me from ordering out. We have been eating out a lot lately so I try to cook at least the lunch at home. This dish took only 10 minutes of prep time and with in minutes I had something healthy for lunch. As you guys know Sarvesh is not a quinoa fan (at all!) but he ate this. I think I will take that. If he eats quinoa, that itself in a win for me! 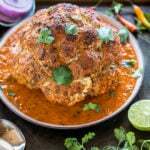 Helpful Tips – I flavored this dish with curry powder and smoked paprika. You can use other spices like if you like the chipotle flavor, add some chipotle powder or if you like it spicy, add cayenne pepper. I personally thought the curry powder went really well here. Sweet potatoes are delicate veggies and when pressure cooked, they turn to mush very quickly. So always remember to dice them into large pieces – 1 to 2 inches big, so that they retain their shape when pressure cooked. 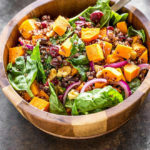 Although we cook for only 1 minute at high pressure for this recipe, but the natural pressure release takes some time and the sweet potatoes will turn mush if they are diced small. So remember to dice them into big pieces! To make this dish more nutritious you can add chopped spinach or kale to it. Add at the very end after the pressure has been released. Add and stir until the leaves wilt. The curry powder that I have used here is not very spicy. If your curry powder is spicy, add less of it. As usual, adjust spice levels to taste. 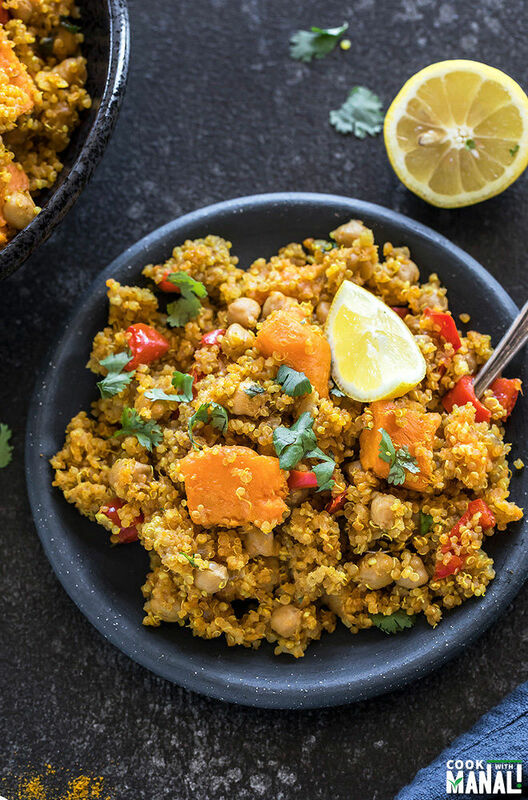 This Instant Pot Curried Sweet Potato Chickpea Quinoa is an easy healthy vegan meal which is so easy to put together in the Instant Pot. Garnish with chopped cilantro and enjoy! *Wash quinoa several times under running water before using in the recipe. This helps in getting rid of that bitter taste. 1- Press the saute button on the Instant Pot. Once it displays hot, add the oil to the pot and then add the chopped garlic and onion. Saute for 3 minutes until onions are softened. 2- Add the rinsed and drained quinoa to the pot and saute for 2 more minutes. 3- Then add the spices – curry powder, smoked paprika and cumin and saute for few seconds. 4- Add the chickpea, sweet potato, red pepper and stir. 5- Add in the water, salt and close the Instant Pot with its lid. 6- Press the manual or pressure cook button with the pressure valve in the sealing position. Cook on high pressure for 1 minute. Let the pressure release naturally. 7- Open the lid and fluff the quinoa with a fork. 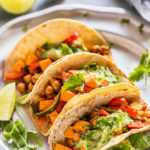 Add cilantro. 8- Squeeze in some fresh lemon juice and toss to combine. Serve immediately! You can also store in an air tight container for meal-prep! 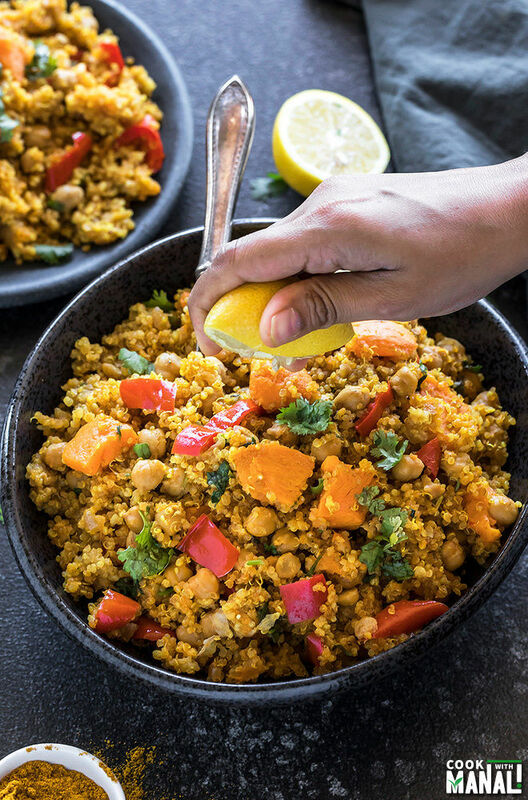 If you’ve tried this Instant Pot Curried Sweet Potato Chickpea Quinoa Recipe then don’t forget to rate the recipe! You can also follow me on Facebook and Instagram to see what’s latest in my kitchen! 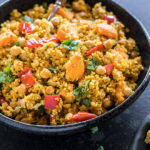 Instant Pot Curried Sweet Potato Chickpea Quinoa - healthy, vegan and gluten-free meal made in the Instant Pot in 30 minutes or less! Great for lunch, meal-prep and to pack in lunch boxes! 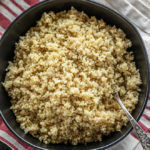 Wash quinoa several times under running water before using in the recipe. This helps in getting rid of that bitter taste. Set it aside. Press the saute button on the Instant Pot. Once it displays hot, add the oil to the pot and then add the chopped garlic and onion. Saute for 3 minutes until onions are softened. Add the rinsed and drained quinoa to the pot and saute for 2 more minutes. Then add the spices - curry powder, smoked paprika and cumin and saute for few seconds. Add the chickpea, sweet potato, red pepper and stir. Add in the water, salt and close the Instant Pot with its lid. Press the manual or pressure cook button with the pressure valve in the sealing position. Cook on high pressure for 1 minute. Let the pressure release naturally. Open the lid and fluff the quinoa with a fork. Add cilantro. Squeeze in some fresh lemon juice and serve! This looks filling and loaded with flavours! I have never used IP to make quinoa…a great idea! I just found your blog and I’m so excited! I can’t wait to try some of your recipes. So many of them sound delicious! I am going to start with this one. Hope you enjoy the recipes Angie! This is my second time making the delicious dish! 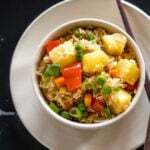 I have had an Instant Pot plus for 1 year and had never used it until this past week when I saw your recipe. 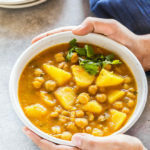 What an awesome recipe to showcase the delicious and healthy food can be made with little fuss in the Instant Pot. Thank you. 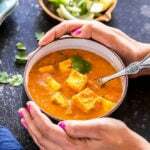 I will look for more of your Instant Pot recipes. You are welcome! 🙂 So happy to know you enjoyed this recipe! I just made this for my meal prep this week. I can’t believe the sweet potatoes cook so quickly – you are right they get mushy. I stirred in bok choy at the end and really liked that addition. Perfect to have all the veg + beans + grains in one meal so there was way less cleanup for my meal prep than usual. glad you liked it! yes sweet potatoes quick super quickly in IP!